Anne Denis is a pianist and teacher based in Portland, Oregon. 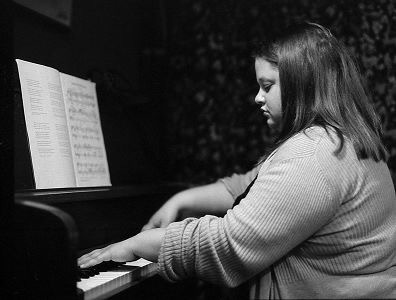 Originally from Buffalo NY, Anne completed degrees in Piano Performance at the State University of New York College, Fredonia and The Ohio State University. Most recently, Anne has achieved ABD status in the University of Memphis' doctoral program where she was a graduate teaching assistant. Anne has participated in summer music programs including the Brevard Music Center, the Heifetz International Music Institute, and Paul Robert's Summer Piano Course in Albignac, France. Anne has been fortunate to have been shaped musically by many great teachers including Robert Jordan, Samuel Viviano, Barbara Lister-Sink, Sean Duggan, Paul Roberts and Harold Gray. Most recently Anne has studied with Mark Westcott and Jean David Coen. Anne performs frequently around the Portland area as both a collaborative pianist and soloist and maintains a piano studio in the area. James Welch is on the faculty for The SUNY at Fredonia School of Music in Fredonia, NY as a collaborative pianist and instructor of class piano. He has accompanied numerous students and faculty for instrumental juries and recitals, various master classes, and has vocal coached and accompanied many of their mainstage musicals. James also serves on the faculty for the Rocky Ridge Music Center in Estes Park, CO, as a collaborative pianist. In past summers he has worked on the faculties for the Interlochen Summer Arts Camp, and The New York State Summer School of the Arts Choral Program as a collaborative pianist for instrumentalists and vocalists on repertoire including art song, opera, musical theater, choral, jazz, pop and instrumental. He has performed for Peter Schickele, Renee Fleming, Lee Hoiby, Dawn Upshaw, Jake Heggie, Ian Clarke, Eric Ewazen, and Jason Robert Brown. As a soloist James was a Second Prize winner of the 2007 Bradshaw and Bouno International Piano Competition. He has performed recitals at SUNY Fredonia, SUNY Buffalo, East Carolina University, Morgan State University, Texas Wesleyan University, Western Oregon University, The Rocky Ridge Music Center, Lucca Italy, and at the Music at Ambialet Piano Festival (now known as Music at Albignac) in Ambialet, France. 2016 has been an eventful year for James. Recent highlights include his debut at the Kitchener-Waterloo Music Society in Ontario, Canada with the Antero Winds Quintet; his music directing debut with O'Connell & Company in Buffalo, NY which included the Buffalo premiere of Adam Gwon's Ordinary Days; a premiere recording with euphoniumist, Erik Lundquist of a sonata from euphonium and piano by Neil Flory; a debut performance with violinist Kaden Culp in Weill Recital Hall in New York, NY; an album release titled Invisible Cities with soprano saxophonist, Jacob Swanson; and the New York State premiere performance of Amanda Harberg's sonata for clarinet and piano with clarinetist, Elizabeth Widzinski. Currently in production, is a recording with saxophonist, Grant Larson which will include a premiere of Philip Wharton's work, Prohibition. Future performance engagements include the chamber music recitals for Music in the Mountains series in Estes Park, CO, and the Australian premiere of works written by Timothy Brown. James holds a M.M. in Piano Performance from East Carolina University and a B.M. in Piano Performance and a Performer's Certificate from The SUNY at Fredonia, with additional studies in piano at the Music at Ambialet summer piano festival in Ambialet, France; and in collaborative piano and opera at the Accademia European Dell Opera in Lucca, Italy.